GLENDALE, ARIZONA --- Phoenix Coyotes President & Chief Operating Officer Mike Nealy announced today that the Coyotes will induct former alternate captain Jeremy Roenick into the Coyotes Ring of Honor on Saturday, February 11 when the Coyotes host the Chicago Blackhawks. Roenick (97) will become the seventh player to be inducted into the Coyotes Ring of Honor, joining Wayne Gretzky (99), Bobby Hull (9), Thomas Steen (25), Dale Hawerchuk (10), Teppo Numminen (27) and Keith Tkachuk (7). Roenick was born in Boston, Massachusetts and was drafted by the Chicago Blackhawks in the first round (8th overall) of the 1988 NHL Entry Draft. He played eight seasons with the Blackhawks from 1988-96, collecting 267 goals, 329 assists and 596 points. He scored 32 or more goals in six seasons and had three consecutive 100 point-plus campaigns (1991-1994). He was named as an NHL All-Star in 1991, 1992, 1993 and 1994. 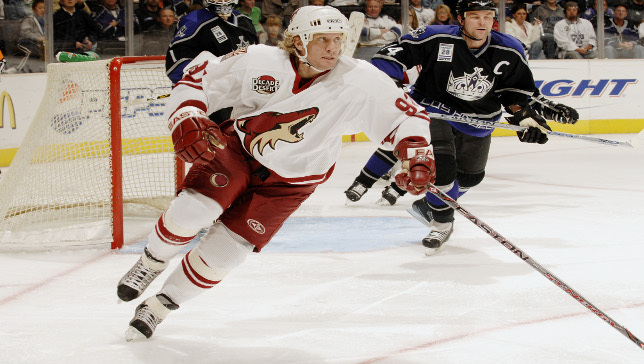 Roenick was acquired by the Coyotes in 1996 and went on to play 454 games in Phoenix, collecting 152 goals, 227 assists, 379 points and 596 penalty minutes. 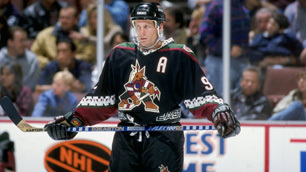 In each of his six seasons with the Coyotes, Roenick scored 24 or more goals and also had three consecutive seasons of 72 or more points (1998-2001). He led the Coyotes in scoring three seasons (1998-99, 1999-2000 and 2000-2001) and was named an NHL All-Star with the Coyotes in 1999 and 2000. He also represented Team USA at the 1998 Winter Olympics in Nagano, Japan. In the summer of 2001, Roenick was traded to the Philadelphia Flyers and in his first season with the team, he compiled 67 points which surpassed 1,000 points for his career. Roenick's strong play earned him a roster spot on the 2002 U.S. Olympic Silver medal team in Salt Lake City. After two seasons in Philadelphia, Roenick was dealt to the Los Angeles Kings in the summer of 2005. He played one season with the Kings before signing with the Coyotes in 2006. In his final season in Phoenix, he recorded 11-17-28 in 70 games. Finally, on September 4, 2007, the San Jose Sharks agreed to sign Roenick to a one-year contract. During the 2007-08 season, he scored his 500th NHL career goal and a few games later, became the second highest American born goal scorer of all time (behind only Mike Modano). Roenick ended his career in 2009 with the Sharks. In 20 NHL seasons with Chicago, Phoenix, Philadelphia, Los Angeles and San Jose, Roenick played in 1,363 NHL games, collecting 513-703-1,216 and 1,463 penalty minutes. The nine-time NHL All-Star, two-time U.S. Olympian (1998 and 2002) and Canada Cup (1991) participant currently ranks 36th on the NHL’s all-time goal scoring list (513), 49th on the NHL’s all-time assist leaders list (703) and 40th on the NHL’s all-time point scoring list (1,216). He is one of four U.S. Born players to score 500 or more goals and was inducted into the U.S. Hockey Hall of Fame in 2010.